This is the 179th consecutive Vigil held in this place at this time on the 23rd of every single month since June 2004. 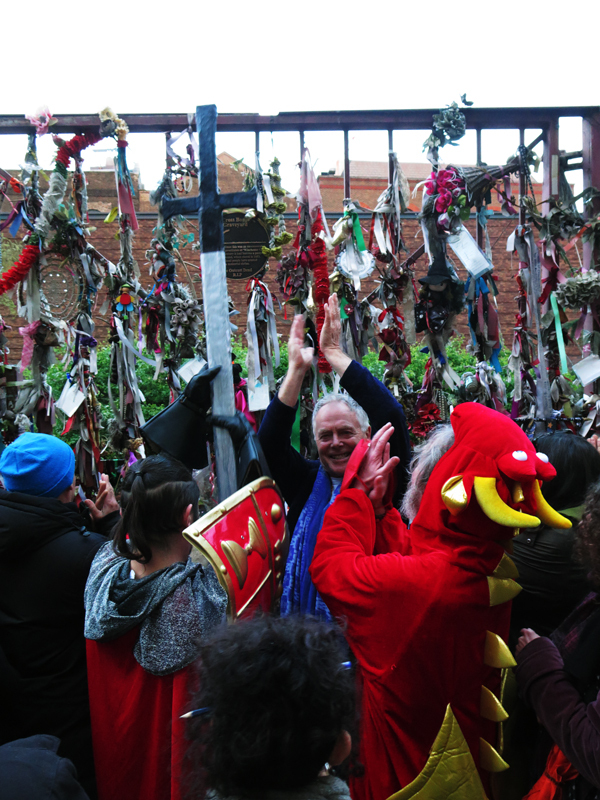 Once more, we renew the shrine, remember the outcast, dead and alive, and reconnect with the secret history and vision as revealed in The Southwark Mysteries by The Goose to John Crow. In April the Vigil falls on St George’s Day. During the Vigil, we reclaim George as an inclusive patron saint – not only of England, but of Palestine, Georgia, Catalonia, Rio de Janeiro and many other countries and cities around the world – and as ‘Our Lady’s Knight’, the protector of our healing works. The April 23rd Vigil traditionally features street theatre – there are rumours of a return visit from St George. And a trickster Dragon? AND… a telepathic link up with the 3 x 23 Discordian pilgrims who on this 23rd April will be performing a ritual at CERN, Switzerland, home of the Hadron Collider! All this unfolding within our time-honoured rituals for the outcast, dead and alive – and the magic that only happens on the night. Gather 6.45 for the Vigil to begin on the stroke of seven. Come prepared to participate and to do a short shift of honour as a Goose Samurai! And to be entranced, and changed, forever! As at all the Vigils, we light the open pathways, tie ribbons to the gate as we speak the echo poem: “Here lay your hearts, your flowers, your Book of Hours…” – and close with our unconditional blessing. At the heart of the Vigil, there’s space for those who wish to share a poem, song or brief personal testimony connected with Crossbones and ‘outsiders’ of all kinds. We especially encourage ‘Goose Rhapsodes’ to learn and recite a poem from The Southwark Mysteries, allowing the spirit of The Goose to live on after John Crow is gone.